While the term “meat and potatoes” doesn’t exactly elicit expectations of a culinary adventure, Fennville’s Salt of the Earth does its part to prove otherwise. If you aren’t familiar with Salt of the Earth, it is a Midwestern, ingredient-focused establishment that sources all of its food within about a 50-mile radius of its doors. A healthy lifestyle calls for a healthy diet. Easier said than done, am I right? Big chain stores may stock a plethora of products, but many of them are processed, treated with chemicals or dosed with pesticides. Yummy! Thankfully West Michigan has plenty of local health-food store options to choose from. Here are just a few. You may know your resident servers and bartenders, but do you know who’s masterminding your favorite dishes? 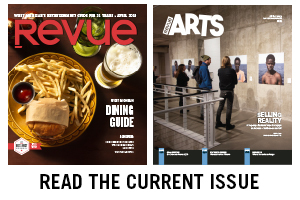 Revue chatted with a few local chefs about how they got started in the kitchen and what’s new on each of their menus. While West Michigan’s LGBTQ nightlife hot spots are not as plentiful as they once were, the raging clubs and quiet bars you can find in our region are legendary. Whether you’re intent on cruising the night away, showing off your pipes at karaoke or workin’ it in a pageant, here are some Michigan fixtures. When entering a coffee shop, one is welcomed by the warm and comforting aroma of richly roasted beans and fresh, brewed coffee. The cozy and aromatic atmosphere entices the senses and the first sip of an artfully crafted beverage brings the utmost satisfaction.